Batman went grain-free in 2012, and I have been very happy with the diet choice. I have a healthy and happy horse without stomach issues like he used to have, little problems building muscle and a very comfortable and balanced energy level. 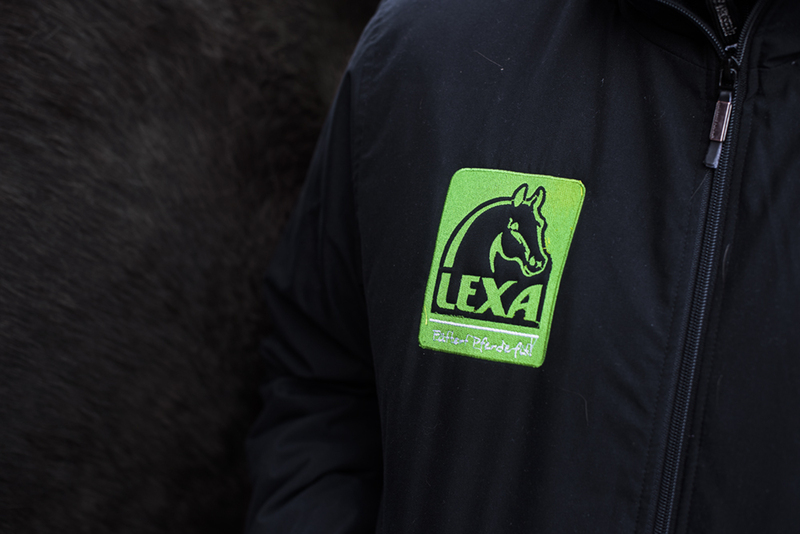 When I visited Arctic Equestrian Games 2017 with Batman in February, Batman received a little gift from Lexa Skandinavia. I had never heard of this brand before as they are quite new here in Norway, and did some research before I gave him the mash – and he loved it! In April, I decided to go over to feeding him Lexa. 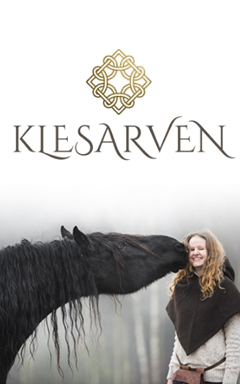 They responded immediately on all of my questions, and were very helpful with the choice of feed, and they also have a line of feed which is made especially for Norwegian horses! I then received a bunch questions regarding Batman and got assistance to choose the optimal combination for him. 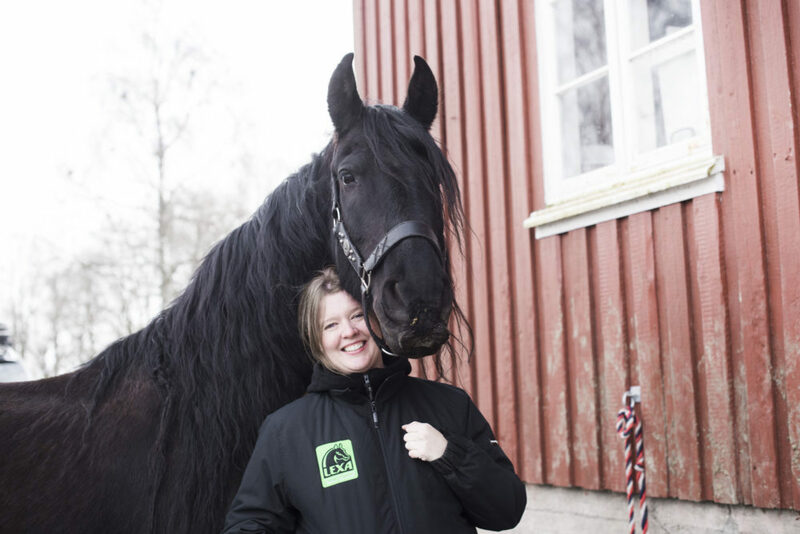 Tanja asked about Batman’s age, daily intake of forage and the nutrition levels in the haysilage he eats, how much I train him, if he suffer from any stomach issues, the hoof quality, any other diseases such as diarrhea, colic, ulcers or allergies. Batman do have a history with stomach problems, he is an extremely sensitive horse and have suffered from colic earlier. He is also the pickiest horse I have ever met. I remember trying to force him to eat his muesli back in the days, and ended up throwing it all away. He simply won’t eat anything he doesn’t like. Frustrating, yep. Anyways! I struggled for years to deal with his issues, so when the company asks questions like this, I feel a lot safer on my choice, especially because I own a horse like Batman. 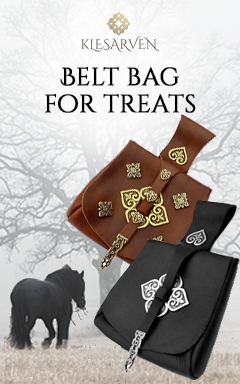 Our horses is of course the most important thing in the world, and the diet is an important decision to make. 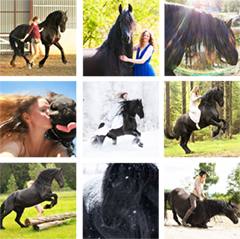 Every horse needs a different diet based on the horses nutritional needs, allergies, diseases, activity level, breed and age and I was happy to have found a company that really cared about every single individual! Tanja stopped by to deliver the feed, she explained everything I needed to know about the new feed, and Batman loved her! Tanja actually managed to find Batmans “spot”, a place I have never rubbed him before. Very fascinating to watch, Batman’s entire body went like “omg mooore”. Therefore, I’m proud to announce that I am now a Lexa Scandinavia ambassador! Woho! 2,5 weeks after I started feeding Batman Lexa, he still love it. And I’m surprised my super picky horse actually likes it, even on the first day, when we started to introduce the new feed, he ate everything in his bucket. That’s a very good sign and weeks later, he is still super eager to get his daily porridge. 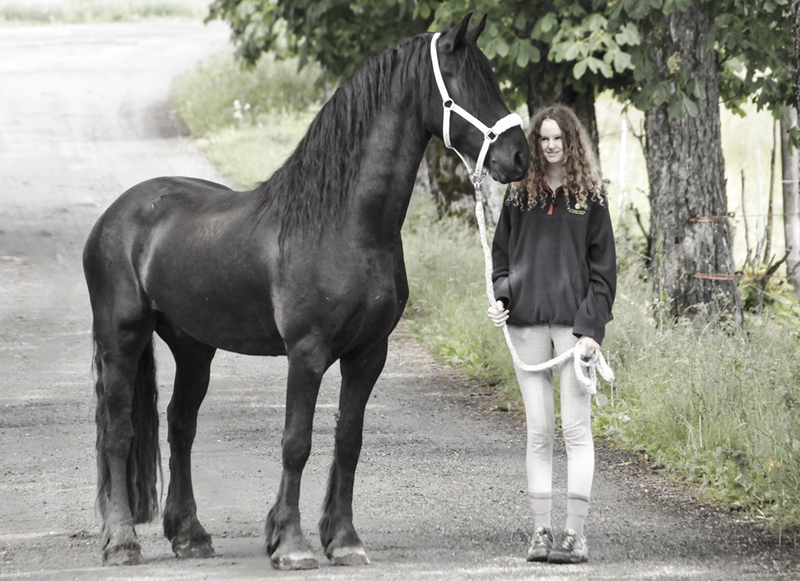 So yep, I can recommend Lexa to picky Friesians with stomach issues, bad topline and sensitive everything. And all he gets, is just a small portion a day. That’s enough! 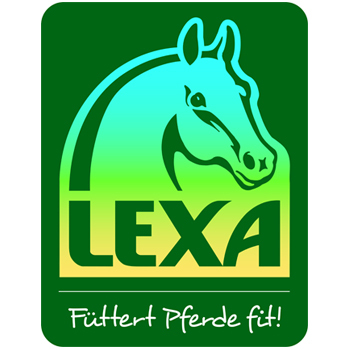 Lexa believe that horses should eat forage only, and if more energy, protein or fat is needed, we can supplement with natural, grain-free feeds in small amounts. 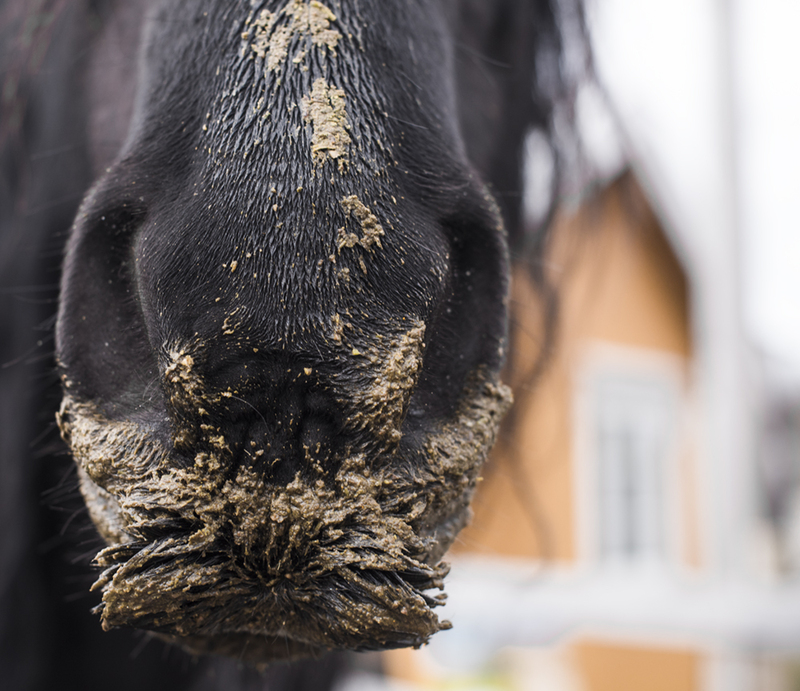 Horses are not made for eating five liters of oats per day. Their digestive system is built to eat grass, small amounts of it, spred through the day. Keep it natural. The base itself. 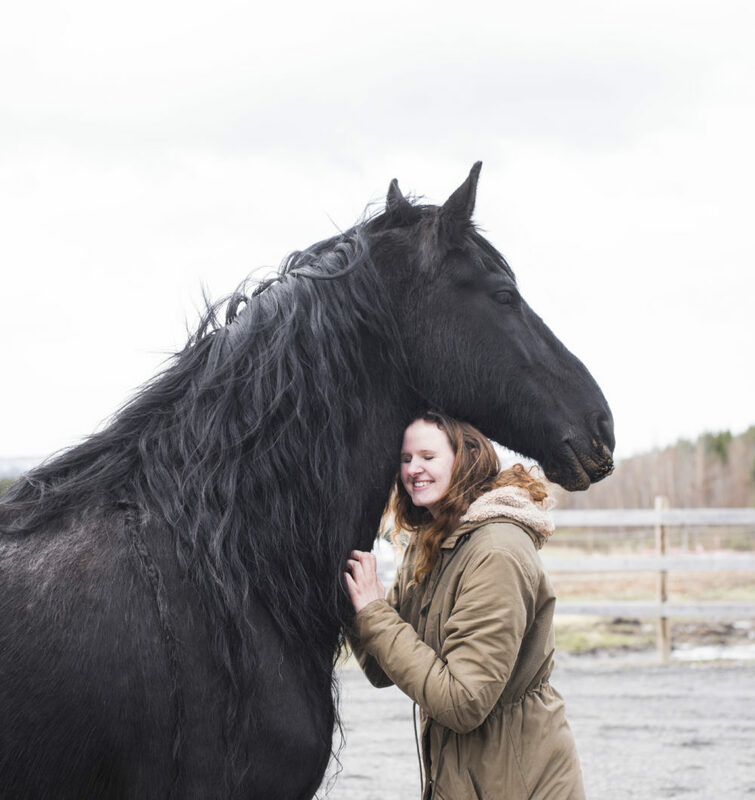 Strukturmix is 100% grain-free, specially developed to fit Norwegian horses nutritional needs. It is also low in starch and sugar. The feed is based on alfalfa flour, linseed, sunflower seeds, chopped alfalfa, blackcurrant, beets, crude oil and flaxseed oil. 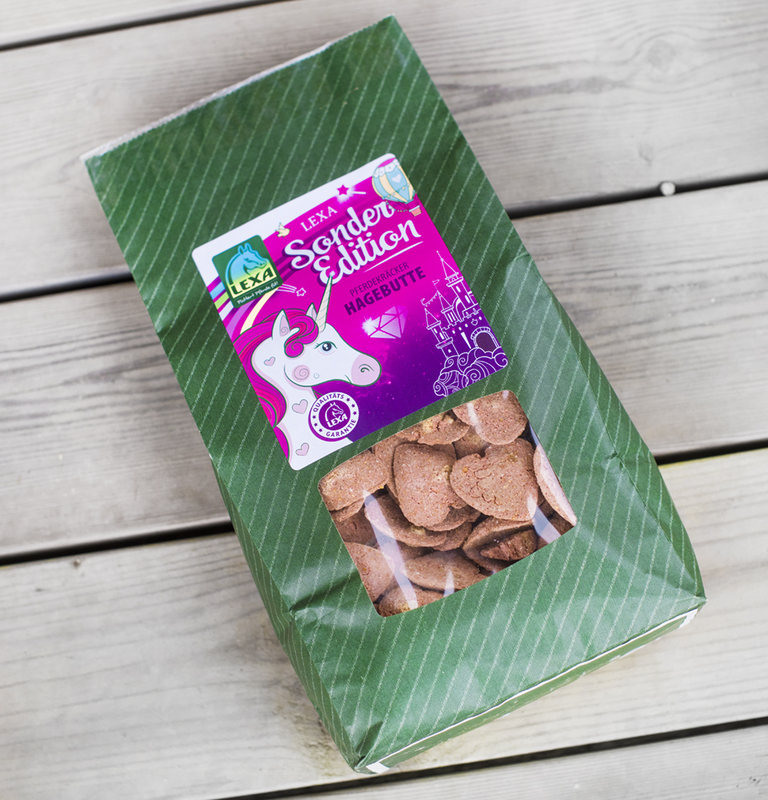 It also contains essential amino acids, herbs and brewer’s yeast, which does good for stomach, digestive system and coat. 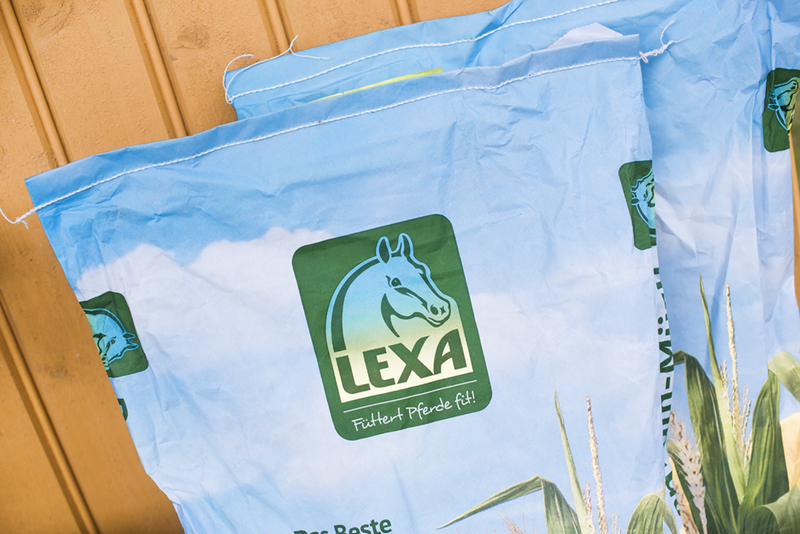 Lexa’s Grain-free mash is low in sugar and starch, contains linseed, hay and alfalfa, probiotics and brewer’s yeast and other goodies! 100% pure beets! Easy to digest, perfect source of fiber, contains betanin, mangan, vitamin C, iron, magnesium and more. Batman also gets this supplement because he lost his topline during the winter. This supplement will help him regain healthy muscle and can also be fed sport horses in hard training. Batman need it as an extra boost to help him build up muscle around the back and pelvis region. This supplement covers Batman’s daily need for vitamins and minerals. The haysilage will of course provide him with some, but most hay lack essential minerals. Therefore, I always keep Batman on a vitamin/mineral supplement to avoid low levels and deficiency diseases. With over 1 meter of hair attached to his neck, reaching all the way down to his knees, Batman has got quite a lot of mane. 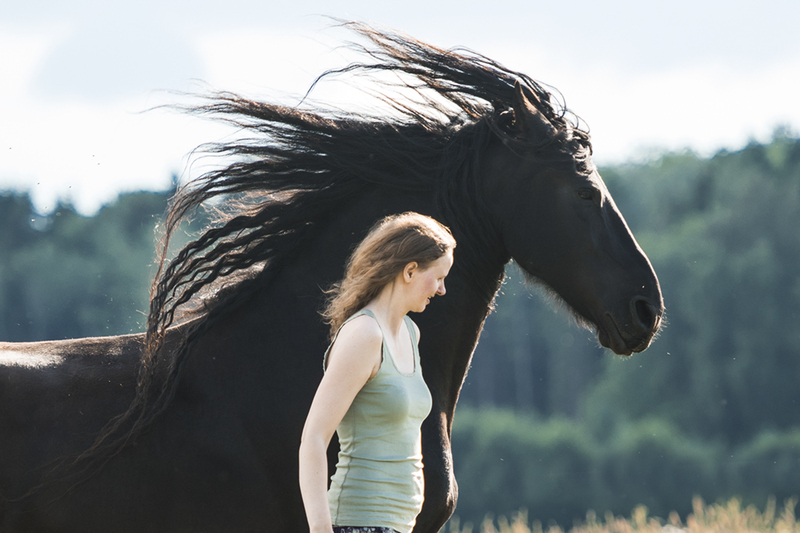 Mane and tail growth has most to do with genetics, and it is difficult to change your horse’s genes. What you can do on the other hand, is to simply take good care of the mane your horse actually have. Protect it! 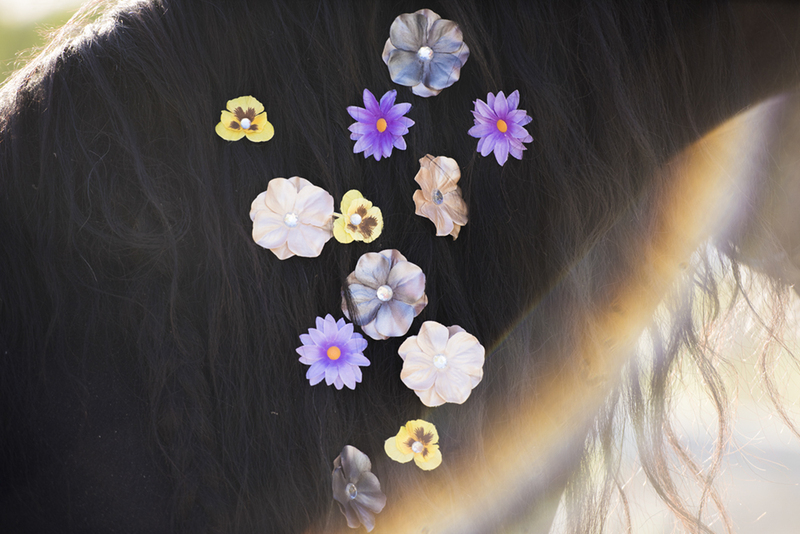 New hair will grow out, and when it does, you can actually prevent damage with a few easy steps. When I got Batman, his mane was so cute. Short, not very thick and matched his baby face perfectly, haha. I never expected his mane to get any longer. He looked like a completely different horse, and over the past seven years, lots has happened indeed .. Here’s an old photo, just for the sake of comparison. Photo from 2009, our first day together. 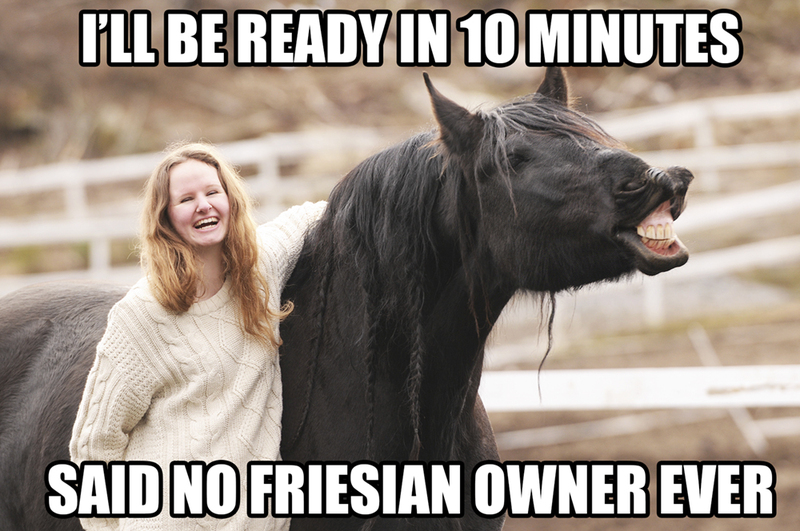 Not a typically hairy Friesian! Over the past 6 years, I have touched Batman’s mane with a brush three times. On a daily basis, I only use my fingers to carefully go through the hair and manually get rid of the knots and tangles in it. It takes more time, but it works. Brushes and combs are effective, but they do remove lots of unnecessary hair, which I prefer to avoid. I’m also careful when I groom the coat underneath the mane, so the mane won’t fasten to the brush. Mane flower clips sponsored by www.fleuracheval.com. I only wash Batman’s mane with shampoo one time per year. He gets shower more often, but a real wash happens only once each summer. When I wash his mane, I prefer Cowboy Magic’s products and I also leave the conditioner in for a couple of minutes before I rinse it out. The result is a clean, shiny and soft mane that is easy to handle and looks stunning. I have used Cowboy Magic for 6 years, but I’m sure other brands will do the job too ;) I have tried several others, but I always end up going back to Cowboy Magic. I use the Detangler and Spray a couple of times a month in mane, taile and on coat, and always before photoshoots. The products turn a dirty and dusy grey-ish horse into a shiny, black Batman ready to take over the world. Cowboy Magic’s Detangler & Shine is my number one favorite when it comes to grooming the tail too. Correct nutrition is vital for both mane, tail, hooves and coat. I’m always making sure Batman gets the correct feed and supplements, so he never lacks any minerals and vitamins. The diet is very important, and I recommend you to dig deeper into the nutrition in both the hay and supplements. 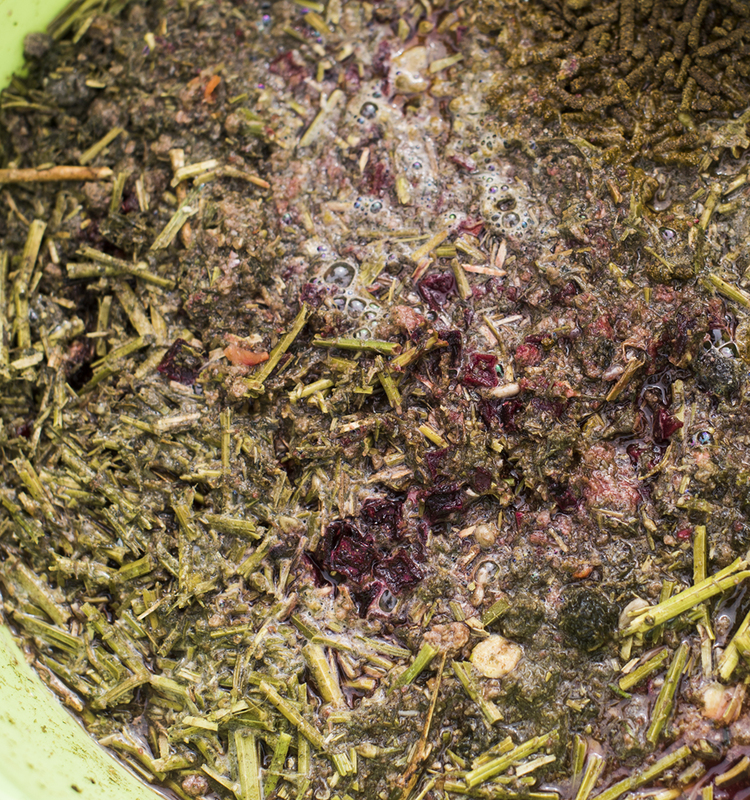 Always have an analysis on your hay/forage, and give supplements based on the results. 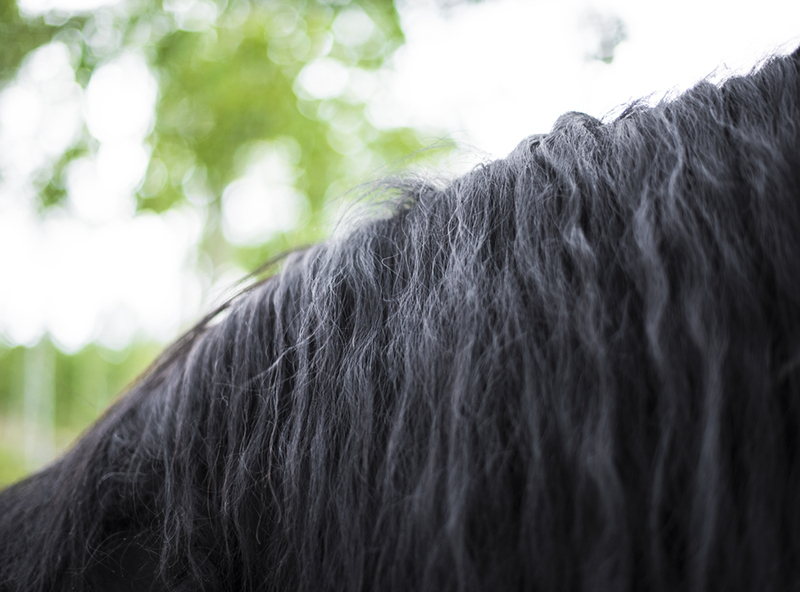 Don’t buy supplements just because the label says that it will make your horse’s mane grow! The more we can cover through the basic diet, the better, but if the hay lacks minerals or vitamins, the horse will need supplements. I regularly take blood tests to make sure everything seems okay. 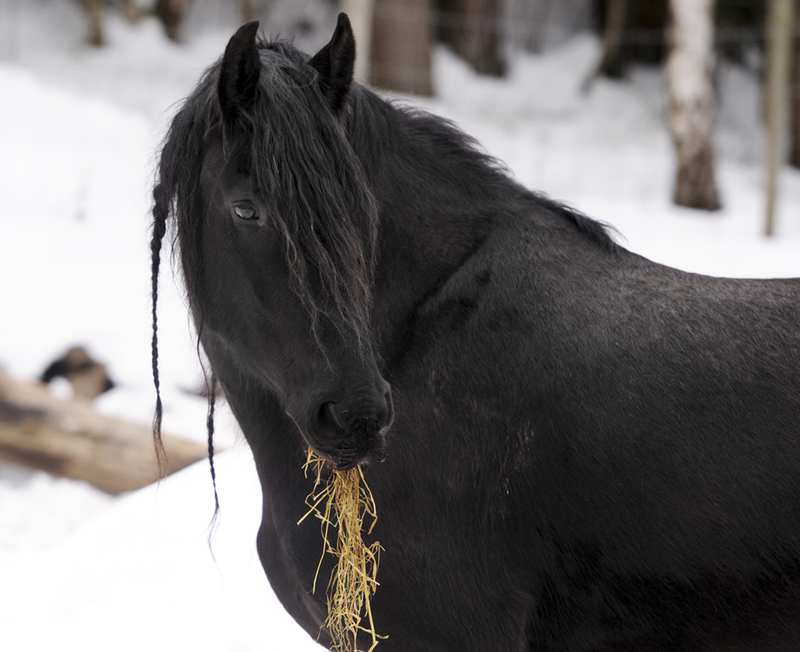 Batman eating hay with braids. My next advice is braids. I braid Batman 24/7, simply to avoid unnecessary amounts of hair to fall off. 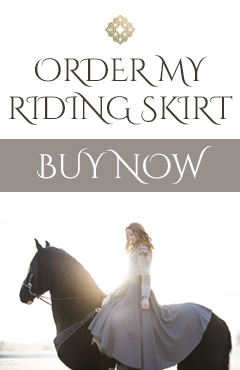 The most important part is the mane further down on the neck, because if you are riding, and your horse have one meter of mane, you will have so much trouble with the mane tangling around your hands, under your seat and in your face. It is nearly impossible to ride Batman in trot without braids, the hair is literally everywhere. 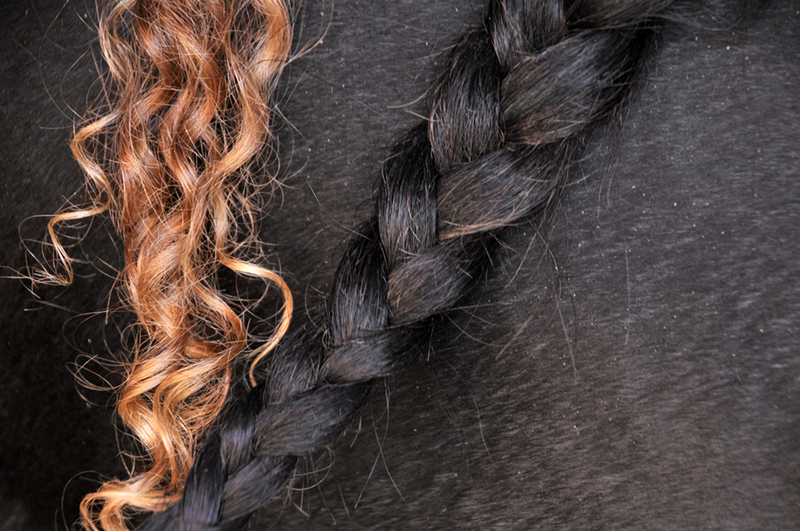 Braids also help the horse avoid being sweaty underneath the mane. 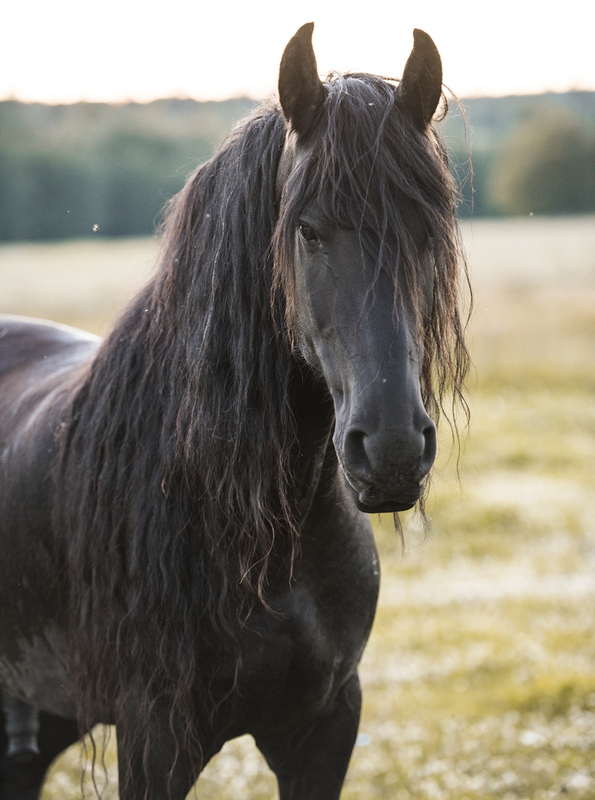 A horse sweating under the mane will eventually start itching, which can lead to large amounts of mane breaking and falling off. I have around six braids hanging down, and use rubber bands to fasten them. Simple as that! His mane gets breaks from braids a couple of weeks here and there, especially in the winter. The first braid I ever made on Batman, in 2009. Batman with braids in 2015. The mane grew rapidly in 2015 and 2016. I don’t recommend you to throw away the rug when your horse needs it just because you want a longer mane, but rugs, especially the ones covering the neck, will lead to more damage on the mane. 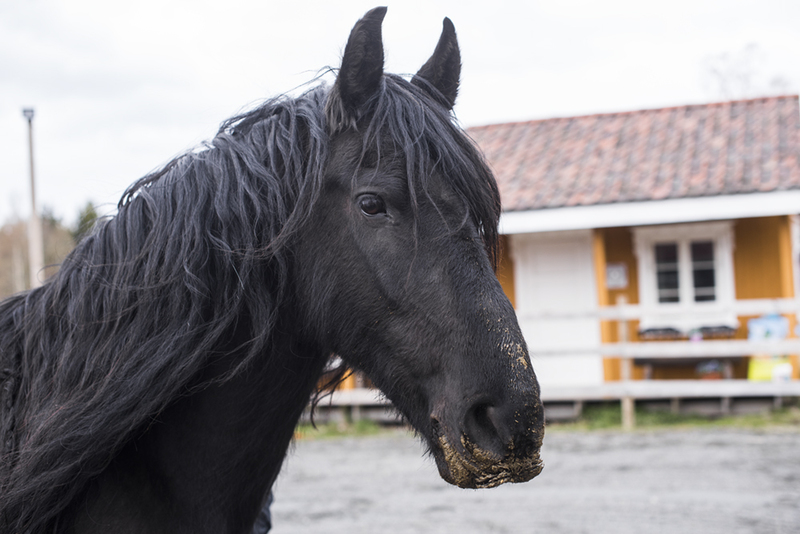 Batman never wear a rug because he don’t need it, and I don’t think his mane would be that long if he wore heavy rugs from September to April every year. Fall 2016, with a super long mane. 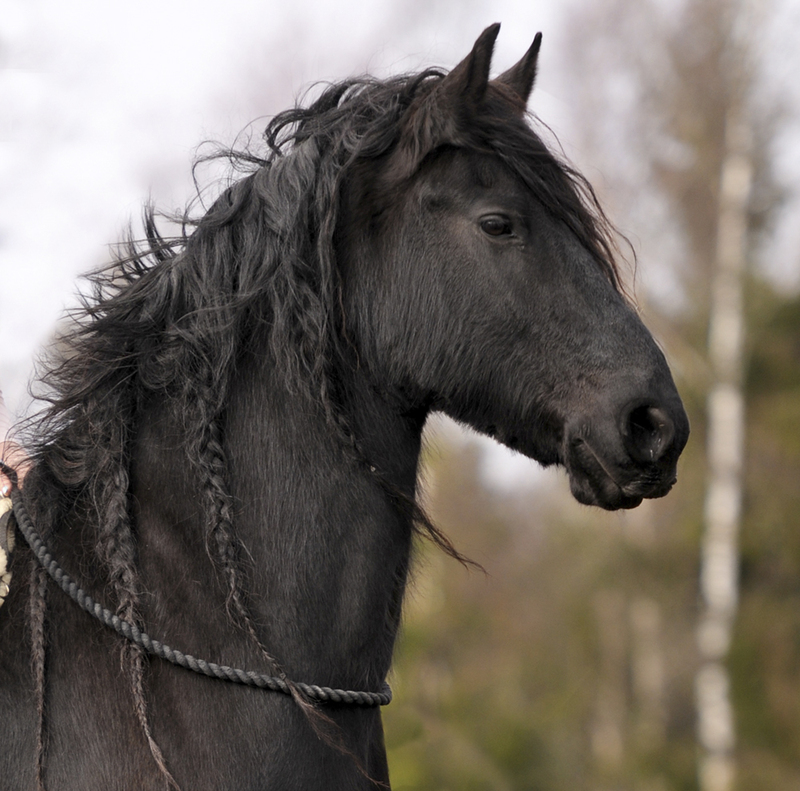 Don’t pull the mane when you are mounting your horse; be careful when riding without braids so you don’t end up sitting on parts of the mane. I remember going for longer hacks with a higher tempo, without braids, and the mane sneaking under between the saddle and my seat. Every time I touched the saddle, I pulled hairs out. Not optimal – a thousand long hairs fell out along the way. New hairs growing out, even at the age of 12. 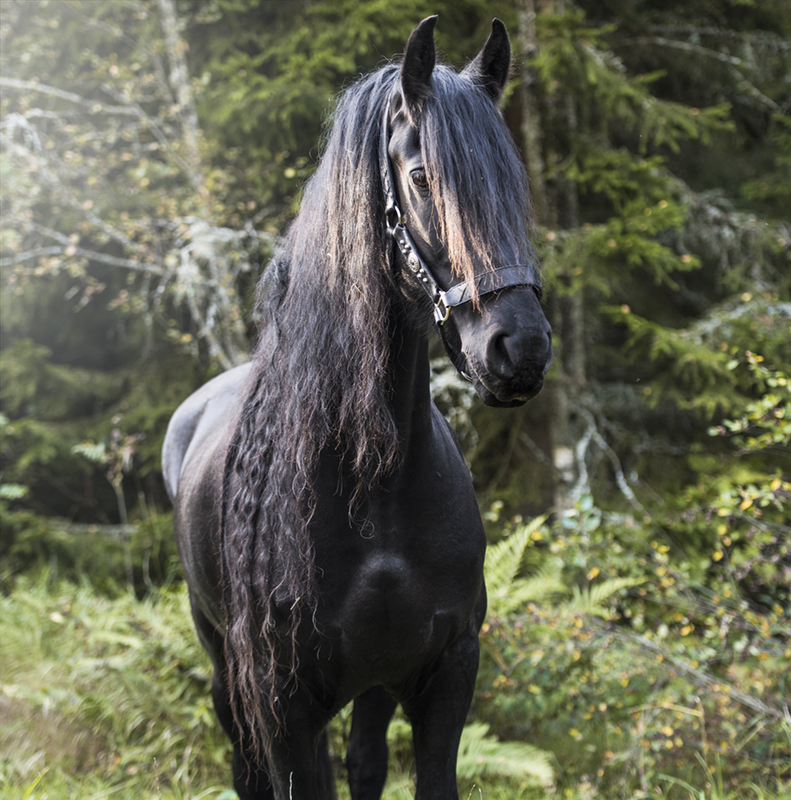 Foals and youngsters can be the devil themselves when it comes to preserving an impressive mane, because some young horses tend to love biting and pulling the mane and tail on other horses. I’m actually glad we don’t have any mane-eating yearling monsters around, haha! They are lovely and playful and fun to watch, until the moment they show up with 10 years of hair growth in their mouth! Trees on the other hand, is it plenty of in Batman’s home, and so far, no unfortunate meetings with mane-eating trees either! Did you know that Batman live on a grainless diet? 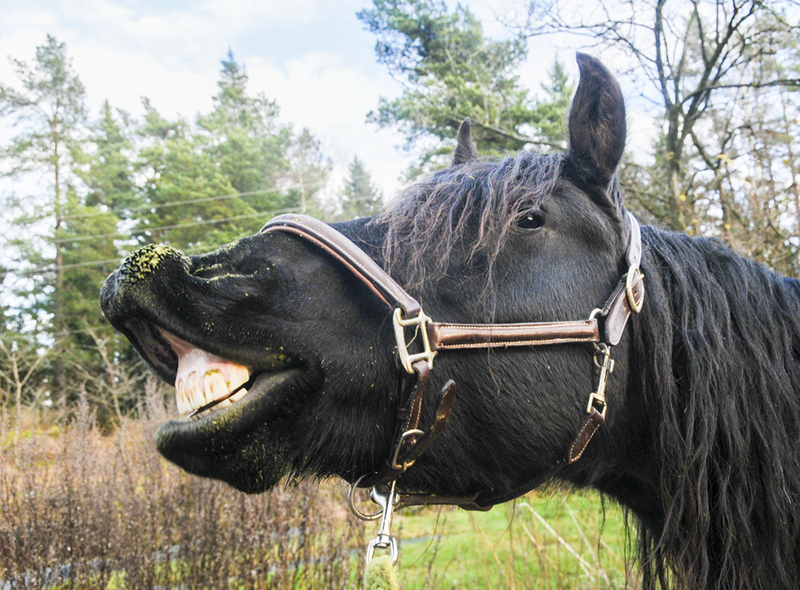 I quit all sorts of grain and müesli based horse feeds back in 2012, and that changed Batman’s life! Horses are from the nature’s side designed to eat grass, so why do we feed them with huge amounts of grain when they can have that energy from forage? Batman used to eat maaany liters of muesli and other fancy feeds every day, but he did not look good at all. Lack of muscle, no energy, skin problems, dandruff … I tried EVERYTHING, but the feeds could simply not compensate for the lack of nutrition in the haysilage (which was pretty good, but not nutritional enough for Batman). 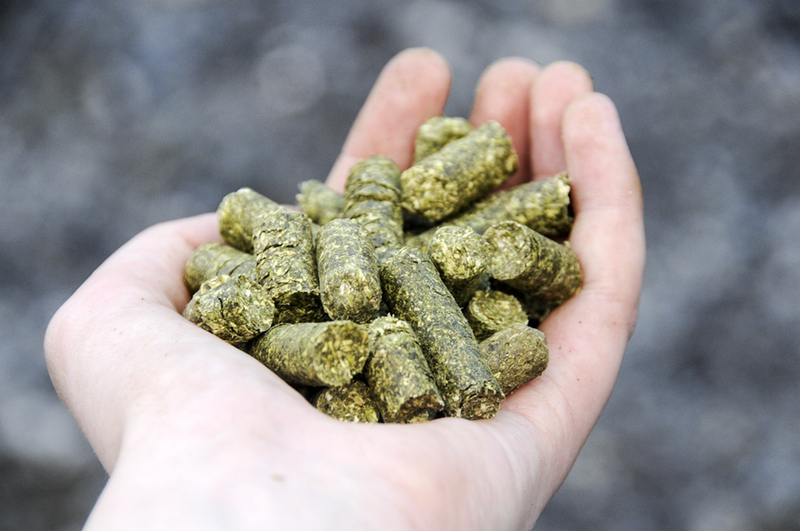 It’s not healthy for horses to eat huge amounts of dry pelleted feed every day. Batman is also a very sensitive horse who has struggled with his digestion many times. 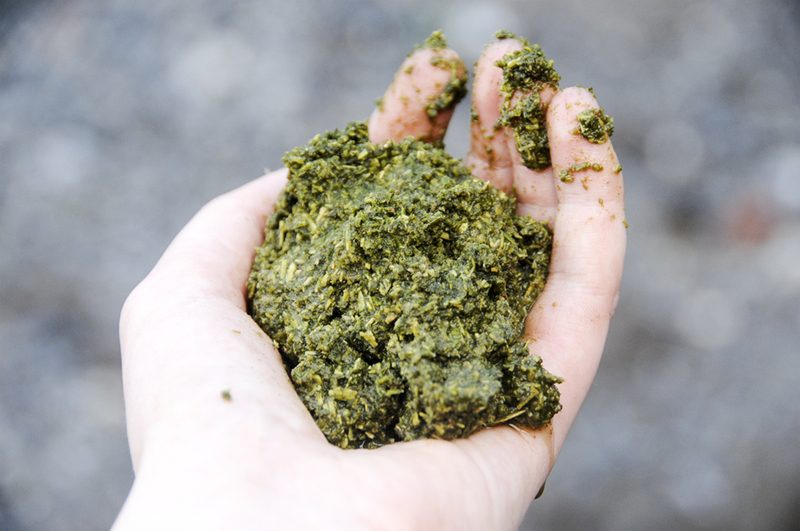 The horse’s stomach and digestion is not even made for handling larger amounts of starch, as most grain contains. They are designed to eat grass many hours a day, slowly. Feeding Batman with tons of grain and muesli was more harmful than it helped him. Giving hay only, and then giving vitamins and mineral supplements would be the best solution, but it’s hard to find the perfect hay, that can cover all the nutritional needs. And then I discovered Simple System! It’s a brand of horse feed that only produce natural horse feed with lots of fibre and without any soy, molasses, preservatives or additives. 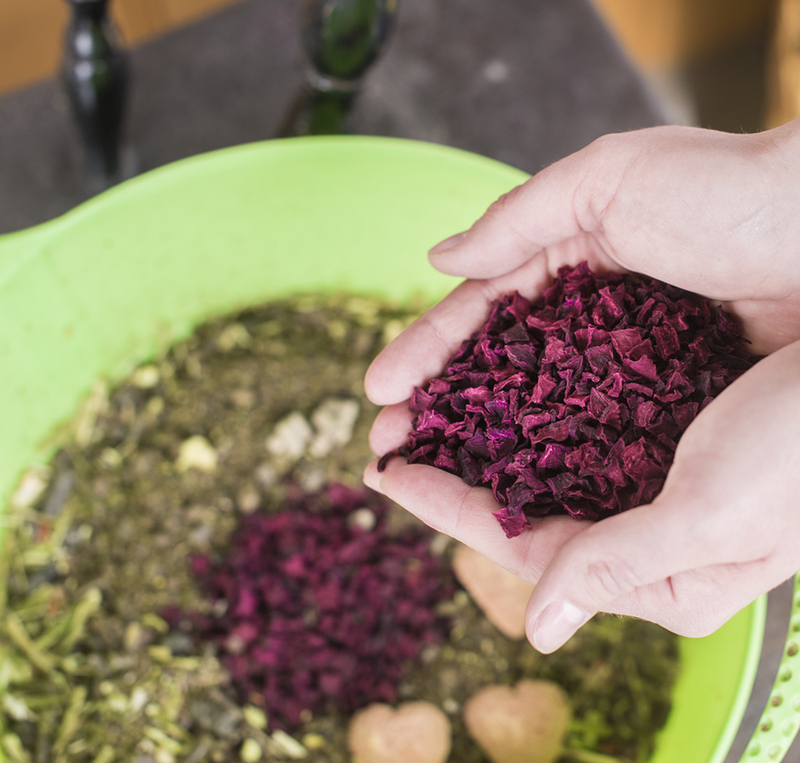 On top if that it’s completely vegan, natural and it is actually forage, made from healthy ingredients horses are naturally developed to eat and benefit from. 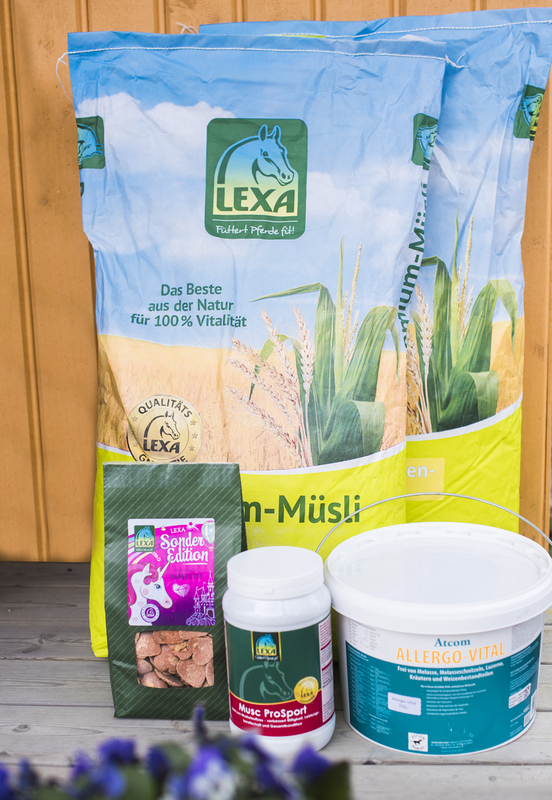 In Simple Systems assortment you can find something for any horse, to everything from high-performance competition horses to retired horses and everything in between, and they have feeds for horses with itch, horses who have struggled with laminits, horses low on energy, with stomach problems, poor coat etc as well. 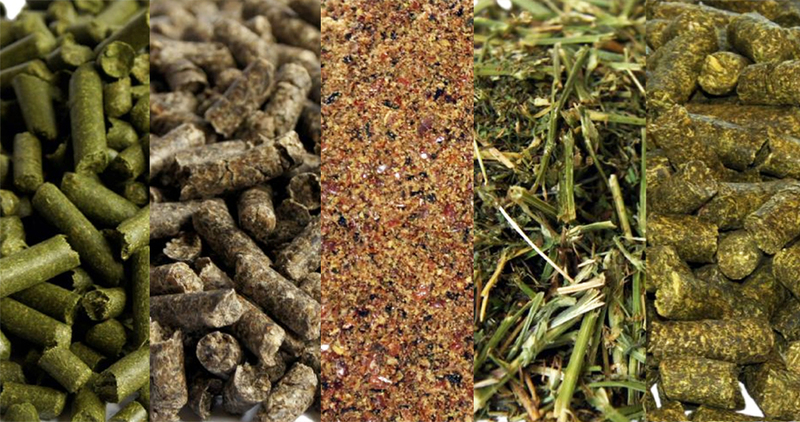 Lucerne in all shapes and sizes, timothy, beet fibre and grass pellets, one hundred percent natural and healthy food that keeps blood sugar steady and provides smooth and long-lasting energy. 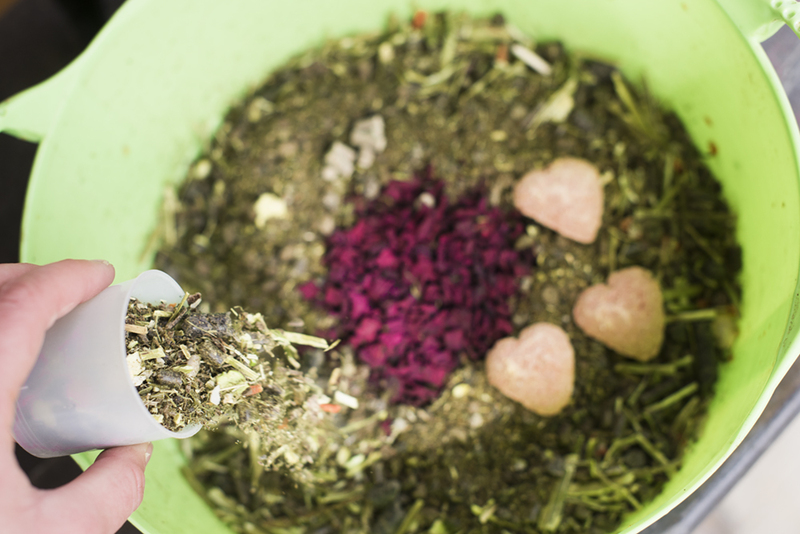 They also have supplements; they are also organic, pure and natural. After reading on their site, it did not take long before I had found a dealer near me I introduced Batman to it. It felt very weird to start feeding in a whole new way, but I received lots of help and advice. 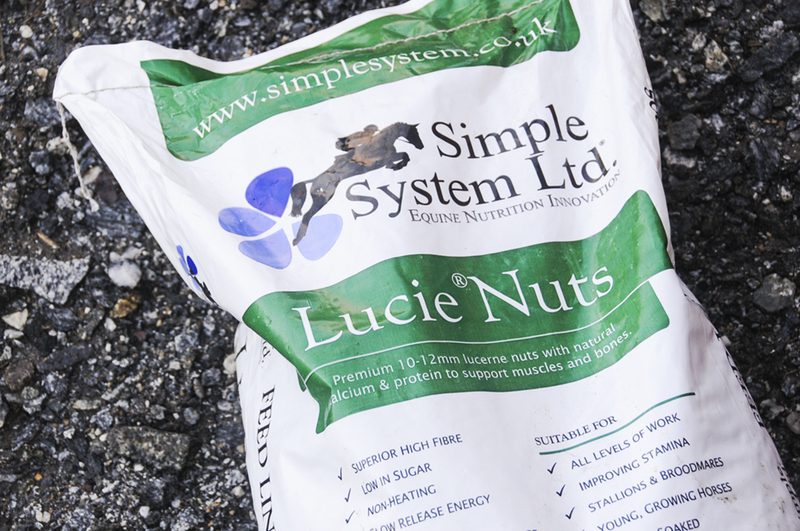 Batman began with eating Lucie Nuts, it is Lucerne pellets you soak, and it will swell to five times its size and should be given as porridge. At first he seemed it tasted weird and would not touch it, but eventually he began to like it and after a week he loved the feed. He ate his dinner twice as fast as before and soon looked like a massive, green mess. I was in heaven, finally I had found something that was both healthy, smart for hot horses, good for horses who tend to be thin, good for the stomach and digestion, good for horses with itching, dandruff or skin problems – and Batman liked it, and on top of that I would finally be able to let Batman live on a diet of only forage. And instead of giving 6 liters grain a day, I can now give him 1 liter with Simple System which is covering the entire daily requirement – so much more economical! He has now been eating Simple System for four years, and eats a mix of Simply Complete, Lucie Nuts and Greengold. I’m still very happy with the products, and Batman still loves the taste. Simple System changed my horse so much and I am really grateful for that! No more grain for my horse! The simplest is often the best, and in this case, why feed your horse a thousand things they don’t even need? I highly recommend you check out their website, www.simplesystemhorsefeeds.co.uk, as it basically gave me a new horse!